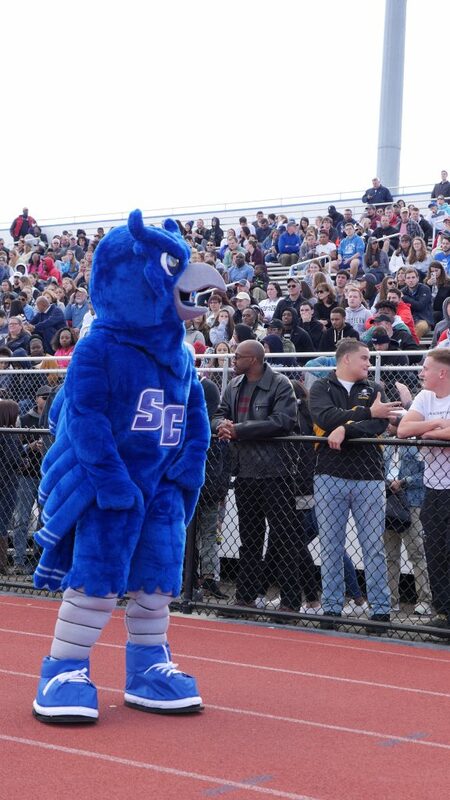 Underneath a feathered, blue jumpsuit and signature caricatured headpiece, beats the heart of school spirit. Constructed of heavy fabric, foam and plastic, mascot gear insulates heat; things get uncomfortably warm, rather quickly. So, when the time comes for Otis the Owl to come out of his nest, who takes the heat? 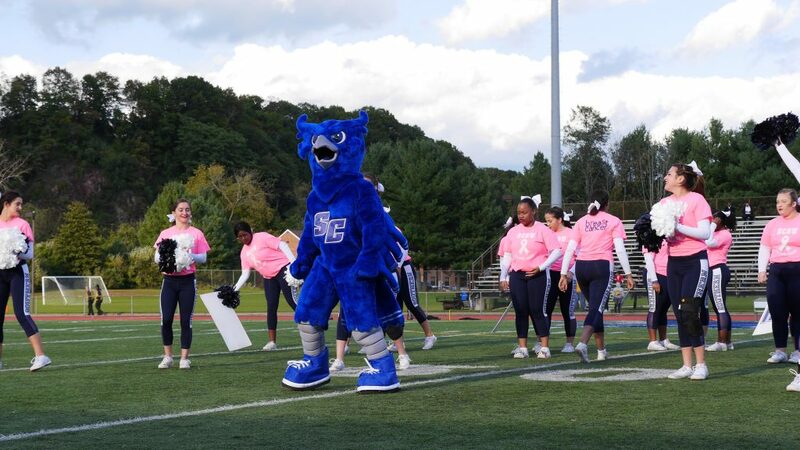 As it turns out, many students and staff members have worn the big blue suit. All they need is motivation and willingness to become Otis. One of these volunteers, Beckett McEwen, premiered the newly updated Otis costume at this fall’s homecoming football game. McEwen, a senior, human performance major, says seeing campus through Otis’ eyes is an irreplaceable experience. After a while, he says, he becomes Otis, and it is not even like he is wearing a suit. Mike Kobylanski, an adjunct professor and former associate director of Athletics/Communications, says beginning in 2010, when the mascot was named Otis, he has been personally responsible for the suit. He says up until that point, there were two suits “floating around,” but when he was assigned to take care of Otis, the university consolidated to just the one, for consistency. Kobylanski says that in most cases organizations that request an appearance by Otis are given only the suit, not the man behind the mask. McEwen says he was shocked to learn, at first, that there is no designated position, and that the athletics communication office makes accommodations on a case-by-case basis. 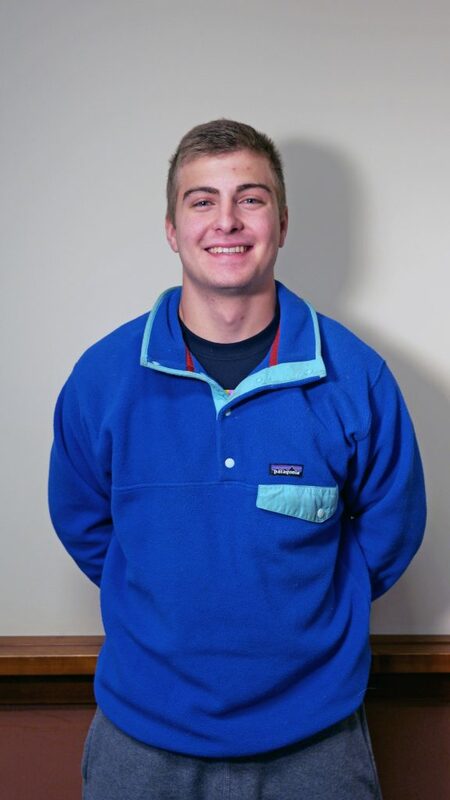 In the cases where the organization does not provide a wearer, Kobylanski says the motivation to assume that responsibility, from student workers or volunteers, has varied. 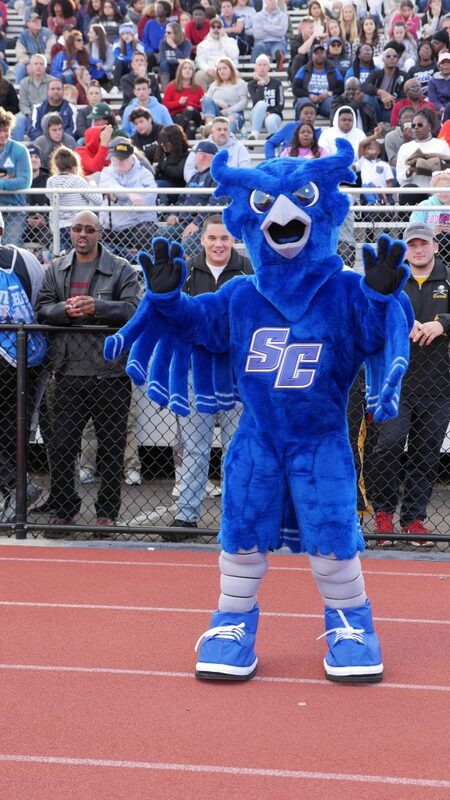 For the premiere of the most recent Otis suit, McEwen paraded around this fall’s homecoming football game, dressed as the university’s owl. McEwen says he had never been dressed as a school mascot before that, but the concept intrigued him, so he volunteered. 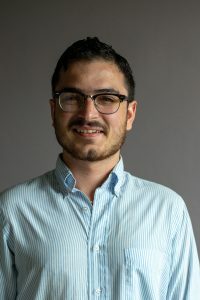 Kobylanski says when push has come to shove, and other options have been exhausted, he has jumped in, himself, and played the role of Otis at university events. “That falls under the, ‘other duties as assigned,’ in the job description,” Kobylanski says. As far as restrictions go, Kobylanski says he only asks that there is some adviser or faculty supervisor present and involved with the loan process. When the suit is borrowed, the organization is given a few ground rules, which are guidelines to keeping the costume, and its wearer safe. “The expectation is that the suit comes back in the same manner in which it was sent out in,” says Kobylanski. McEwen says he was told to keep Otis out of precarious positions, and not to hold anything fragile. When clad in the full-body gear that defines the image of Otis, Kobylanski says things begin to get sweaty and warm, fast. Some state-of-the-art mascot costumes, that have been manufactured recently, come with a built-in cooling system, Kobylanski says. McEwen said the costume that had been used for several years prior, nor the one introduced this past fall had such accommodations. Kobylanski says athletics communication takes the safety of the wearer very seriously, considering the heat. “Regardless of what the temperature is outside, you really have to wear a T-shirt and shorts,” says Kobylanski. Hydration, and taking breaks to stay cool are key, Kobylanski says. Because the new suit is made up of three different layers, McEwen says, it is not just hot, but uncomfortable, tight, and hard to maneuver around with. McEwen says he wishes he knew that before ever getting into the suit. That was the aspect he was least prepared for. The experience is surreal, according to McEwen. He says as a wearer, he did not feel like himself, but like Otis. The attention is certainly different when he is inside the suit. Endless high-fives, posing for pictures, and people watching him and cheering was a celebrity experience, McEwen says, but the correct balance is necessary in order to keep up the mystique. As far a further maintenance, Kobylanski says Otis is routinely sent out for professional attention, where the suit is cleaned thoroughly, and any minor scuffs or tears are addressed as well. A company out of Hamden is tasked with the maintenance of Otis, according to Christopher Lynn, head equipment manager. The company, called Clean Gear, specializes in cleaning athletic gear, and uses a heavy-duty washer and dryer originally developed to clean and sanitize hockey equipment. Lynn says Otis is sent to this type of check-up once every year. Requests are made, often, at the administrative level, Kobylanski says, to have Otis appear at major university events. 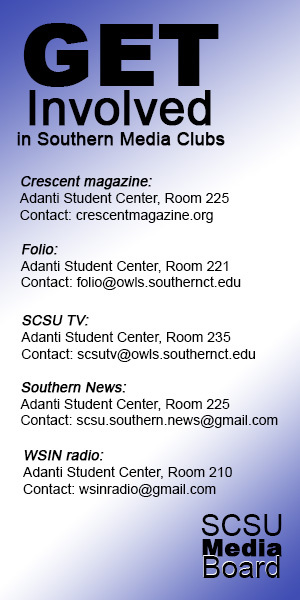 The most prominent appearances, he says, are commencement, convocation, orientation sessions, and new students’ day. At these larger university events, Kobylanski says having Otis present enhances the display of school spirit. Contributing to that energy, says McEwen, is an experience he recommends to anyone who might consider volunteering to be Otis in the future.